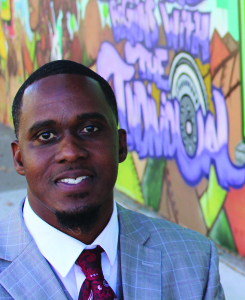 City Council candidate Dameion King works as a career coach for those re-entering society after prison sentences, and advises area nonprofits on strategies for change in urban communities. It’s his first appearance in the official Richmond politics scene, but he says he’s no stranger to the needs of the city. “I’ve woken up in the morning with gun holes in the wall. I know what it’s like to come from nothing…I also understand the power of innovation and progress.” Read more about King on Richmond Pulse. This entry was posted on October 2, 2014 by Editor in Print, Richmond Pulse and tagged Community organizing, Politics, prisoner reentry.